For the genus of snakes, see Furina. Furrina, also spelled Furina, was an ancient Roman goddess whose function had become obscure by the 1st century BC. Her cult dated to the earliest period of Roman religious history, since she was one of the fifteen deities who had their own flamen, the Furrinalis, one of the flamines minores. There is some evidence that Furrina was associated with water. According to Varro and Georges Dumézil Furrina was a goddess of springs. Her name would be related to the Indoeuropean root *bhr-u-n, Sanskrite bhurvan, indicating the moving or bubbling of water, cognate to Gothic brunna ("spring"), Latin fervēre, from *fruur > furr by metathesis of the vowel, meaning to bubble or boil. Compare English "fervent", "effervescent" and Latin defruutum ("boiled wine"). The goddess had a sacred spring and a shrine in Rome, located on the southwestern slopes of Mount Janiculum, on the right bank of the Tiber. The site has survived to the present day in the form of a grove, included within the gardens of Villa Sciarra. Excavations on the site conducted in 1910 identified a well and a system of underground channels, as well as some inscriptions dedicated to Jupiter Heliopolitanus, Agatis, and the nymphae furrinae. However these findings look to be of a later date (2nd century CE) and perhaps the well is not the original spring. Gaius Gracchus was killed in the Grove of Furrina. According to Cicero another sanctuary dedicated to the cult of Furrina was located near Satricum. This place was not the most widely known one but a hamlet near Arpinum. Furrina's festival was the Furrinalia, held on July 25. 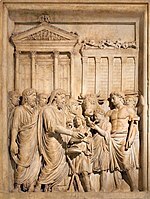 On the Roman calendar, festivals separated by an interval of three days were interconnected and belonged to the same function. In the second half of July, the two Lucaria occur on the 19th and 17th, with the Neptunalia on the 23rd and the Furrinalia on the 25th. This grouping is devoted to woods and running waters, which are intended as a shelter and a relief from the heat of the season, the canicula. According to Martianus Capella, Furrina is a low ranking deity who has her seat just above the mountain peaks. ^ Varro Lingua Latina VI 13. ^ De Lingua Latina VI 13. ^ G. Dumézil Fêtes romaines d'eté et d'automne Paris, 1975. ^ Cicero Ad Quintum fratrem 3, 1, 12. ^ Samuel B. Platner (and T. Ashby) A Topographical Dictionary of Ancient Rome, 1927 s.v. ^ Cicero Ad Quintum Fratrem 3, 1. ^ As observed by Dumézil and Georg Wissowa. Altheim, Franz (1938). A History of Roman Religion. Harold Mattingly, trans. London: Metheun. Dowden, Ken (2000). European Paganism: The Realities of Cult from Antiquity to the Middle Ages. London: Routledge. This page was last edited on 13 December 2018, at 18:35 (UTC).